Morning hasn’t quite emerged from night yet, and it’s still too dark to appreciate the forested lake path to the main lodge. You call the pampering staff to pick you up in a van for door-to-door help with gear and transport to the main lodge. Instead of cabin room service, you try breakfast at Cavell’s where casual gourmet is fine dining with local infusion. Morning fare includes a scrumptious array or a la carte. Much of the restaurant’s honey comes from the bees that live on the roof. The staff has been known to help pick the fruits and vegetables locally, and the chef works with Alberta farmers for the best organic produce. 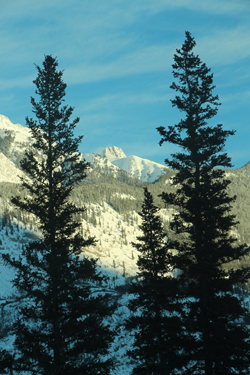 For a morning of skiing, hop on the 8 am shuttle going up the mountain to the Marmot Basin Ski Area. Elk sightings are a bonus as the van’s headlights illuminate tree sentries in a world of white. 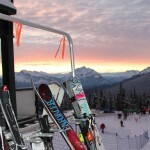 Arrive at the ski lodge as the sun debuts with splashy pinks across the mountains horizon. Skiers and snowboarders are already painting sinewy Ss into the snow. If you have signed up in advance for private one-to-one instruction for snow boarding or skiing, you have a guru meet you and guide you for the rest of your day. Dave is part teacher, concierge, and coach who can help with everything from selecting and tightening your boots and skis for the best fit at your skill and fitness level, to showing you the secret bathroom that means no extra stairs in the boots. Once out the door and near the slopes, he is photographer, historian and instructor with patience and a ready smile. He reviews the fundamental basics and provides tailored exercises to undo bad habits. 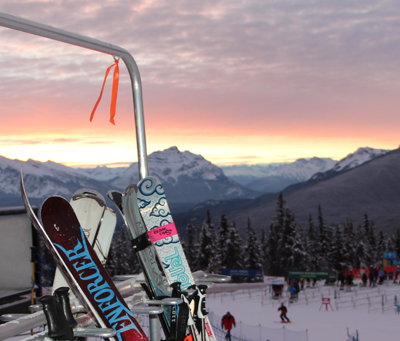 He selects the chair lifts and paths that will best help both your learning curve and your pleasure quota. 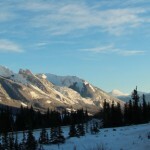 Riding ” the longest high-speed quad chair in the Canadian Rockies” to the top provides scenery bonanzas. Dave designs a beautiful route down that includes sections of three different named runs. At one point no other skier or snowboarder is in view. 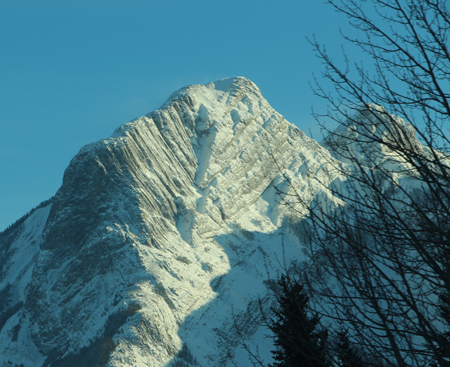 Majestic peaks are. The snow is powdery delicious, not icy and crusty, not squishy and smushy. You understand how people become skiing fanatics. A lunch break at Caribou includes a delicious salmon burger and salad with good company. You hear a tale about a WWII secret plan in nearby Lake Patricia to build an aircraft carrier of ice. 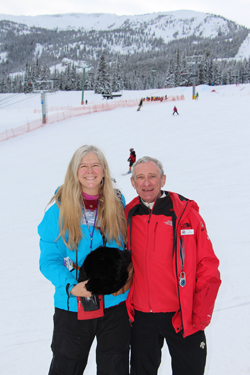 You meet Dave’s charming wife who also inspires people up and down the mountain runs. You have to stop skiing to make the 2:30 shuttle. You want more, but know that less is better here. You haven’t fallen or broken anything, you learned some good techniques to practice, your endorphins hum, and the scenery is a high; you are glowing. And the next luxury awaits. Your signature spa treatment awaits in your own niche of the Fairmont’s 10,000 square feet sanctuary in the Main Lodge. You skip the interior access to the great outdoor pool, the inviting sauna and steam room. You change and ease right into a 90 minute session to cleanse and rejuvenate your skin, and sooth any muscles that might be tired after skiing . Brittany welcomes you with her soothing voice and nurturing trained hands. First you breath deeply and inhale lavender and eucalyptus , and exhale troubles. “The Blue Reflections” for some might be to chase away the winter blues, but at JPL it’s to celebrate the blue skies and “Blue Magic” lavender. Brittany works her magic with especially formulated scrubs, rinses, and moisturizers as she explains that lactose acids build up after a work-out and massage is a great way to flush out the toxins and get the circulation going. You feel like a super athlete with this post ski session, and like royalty ( you heard that the Queen Mother stayed at the Fairmont JPL, but no word on whether her blue blood ever circulated better because of a “Blue Reflections.”) From head (your scalp is massaged with hot oils for deep hair nutrition ) to toes ( ahhh, massage) you feel relaxed and revived. To make sure your stomach is not deprived, you asked for Room Service to deliver to the spa, and enjoy a chef’s plate of delectable cheeses and fruits artfully arranged. 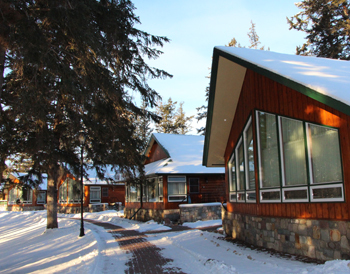 It is tempting to stay in the spa’s comforts and float into dreams, but you planned to add exploration to your luxury since Jasper National Park is a “Dark Sky Preserve” and you were told that Maligne Canyon is part of the largest karst system in the world! Karst topology can be drainage systems of caves- above or below ground, and sinkholes formed by bedrock that is dissolved over time. In the lobby you meet with a few other intrepid spirits who are sharing their boot sizes with guide Wes Bradford of Sundog Tours . He hands out boots, headlamps, hand warmers to go in mittens, and “icers” to clamp footprints of spikes on the bottom of your boots, the better to grip for ice-walking. .A drive later and you are walking under the mega astronomic canopy of a “Dark Sky Preserve.” Tales of shooting stars and northern lights and the huge arc of the Milky Way make the current cloud cover seem oppressive and rude. But you decide to forget the “have nots, “ of your night, and the “haves” makes it seem like you are enveloped in a gigantic cosmic cave –seeing only what headlamps illuminate. Wes stops to point out with a flashlight the deep canyon to the right and the animal tracks in the snow to the left. Wolves are very large here. It’s 20 below zero (C not F) and when you descend into the canyon, the path ends as you walk in the stream bed, some of it moving liquid and some of it ice- solid. 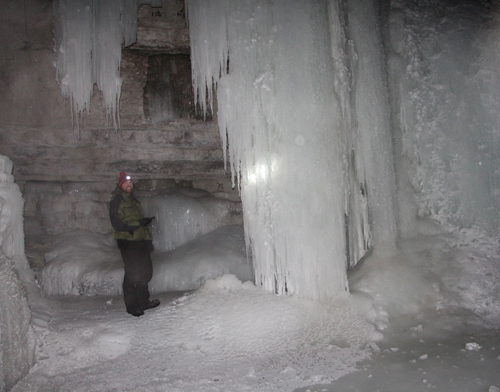 You are flanked by nature’s ice sculptures seen with dramatic patches of flashlight. If you wear glasses, you will want to make sure your excited steamy breath and warming headwear are not creating fog blindness or a mini-weather system with clouds and then rain between your eyes and glasses. You not only will act like a wimpy, dorky adventurer since you can’t even see your own feet, but you might fall and miss some of the hanging icycles or the fossils that Wes points out. When your night vision is clear, it’s fun scampering and crawling and leaping in the streambeds, grabbing onto solid ice columns to pull yourself up to peek into a cave. The elements direct a landscape that changes nightly. You can hear water behind walls of ice. You are in geology’s drama. For most of history, people had curiosity about the mysteries and beauties of nature, but they didn’t have headlamps, glasses, hi –tech fabrics, hand-warmers, and cold-tolerant cameras. Along the path from cabin to main lodge. A private ski lesson! Sonne with instructor Dave. Photographs by Lisa TE Sonne except the Spa photo, courtesy of Fairmont JPL, and this one thanks to Sarah Sekula. 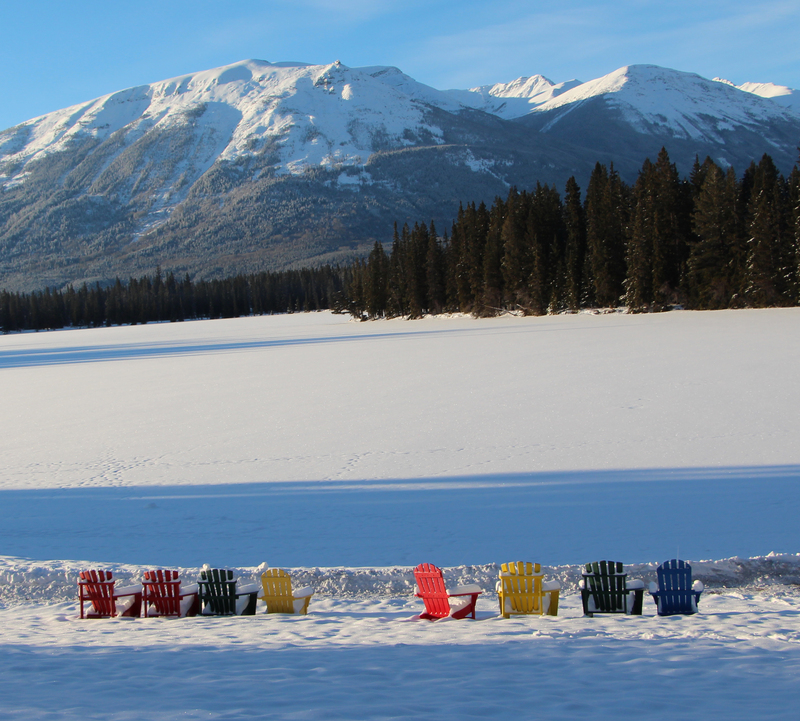 Ready to plan your own trip to Jasper, Alberta, a Fairmont? Traveler’s content is settling over me like a well- placed comforter. 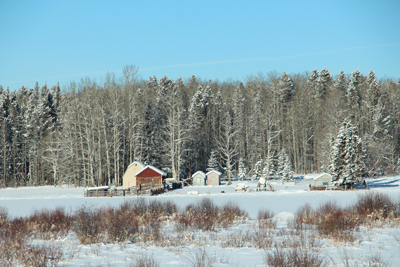 The train rocks me, the scenery is flocked forests and red barns with roofs of thick white snow and tribes of bare-branched birches collecting ice crystals like ornaments. So many shades of white. The Eskimos have dozens of words for snow, I need a more versatile vocabulary for the blue-whites, green-whites, and brown-whites so soothing to the eyes viewed from the pleasures of a moving train. A bit of traveler’s dilemna. My body wants sleep. My cabin is one big cradle and the bed is so nicely pulled down. My eyes want to feast on window fare—a tall steepled church monolithically rising from the white just passed before I could get my camera on. My mind says use the time for writing stories, for overdue emails, for writing thank yous… no, it argues, don’t forfeit tracks of uplifting “now”– meditate on the cold world beautifully framed by the window, a moving canvas of a realm harsh to others and benign to the pampered traveler. I have started writing about yesterday for this column, but the light is so cheerfully bright outside. I expect the cone-shaped firs to start twirling in dance like Christmassy tops. Blue sky over the clean whites, clusters of horses, curved parallel lines- ski tracks to somewhere I can’t see. 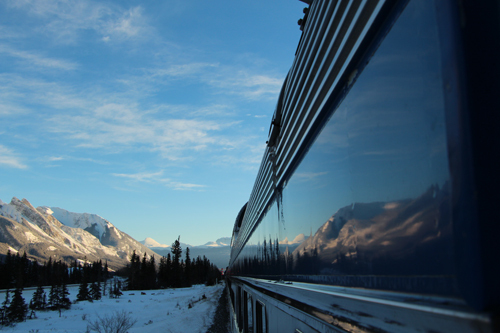 We left Edmonton many kilometers of tracks back, heading through Alberta, Canada from the bright lights of a dynamic creative urban center to the raw wilderness and muses of the Canadian Rockies. 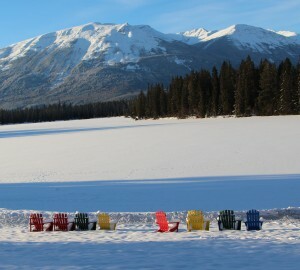 Ahead, Jasper National Park with its Dark Sky Preserve, as well as the comforts of the renowned Fairmont “JPL”- Jasper Park Lodge. My highlights in Edmonton –staying at the historic Fairmont MacDonald, the “Chateau on the River”; a regenerating NVE Institute spa treatment by the innovative founders; the private tour at the Art Gallery of Alberta, the building itself a work of art; Chef David at the museum’s Zinc Restaurant with his creative “open concept” cuisine, Madison’s Grill with its inviting hospitality– are all physically behind me now, but they are packed in my internal luggage. Now just isn’t the time to unpack them. 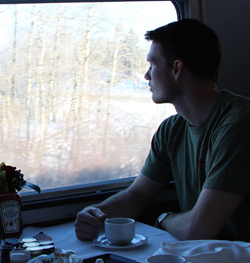 I am nestled in one of Via Rail’s most spacious sleeper cars with a private bathroom, having enjoyed good service and food in the dining car. And now the soul food of nature is out my window. The Rockies thrust up assertions of tenacious glory. The scrimshaw of geology etches jutting timetables to the sky. And the train keeps rolling forward.